Pillow is exactly what I was looking for! It's the perfect size (i ordered a king) and the perfect firmness. Definitely recommended for a side or back sleeper! 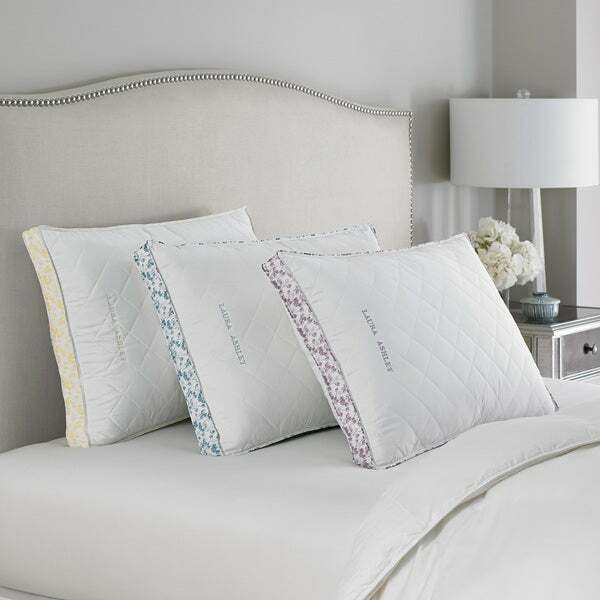 Softly shaded tulips subtly adorn the edges of this pillow, from Laura Ashley, constructed of quilted, soft microfiber polyester with a plush polyester fill. Choose from medium, firm, or extra-firm densities to fit your sleeping needs. The color of the tulip matches the density of the pillow - yellow represents medium, blue is firm, and violet is extra-firm. This Laura Ashley pillow is a Sealy pillow. I got it in a medium and paired this pillow with a couple of firm Sealy pillows. This medium feel pillow is just the right "fit" and can be doubled up to put under one's head for the right Comfort level. But don't worry, the pillow will bounce back to shape in the morning even if you have crunched it up! Very comfy and attractive (although you don't see the pillow once it is in its pillow case)! LOL. High-quality and highly recommended. I love these pillows so much, I'm going to buy more! I bought the medium and they are just perfect amount of firmness for me. I am now buying medium in the jumbo size for my spare room. Fantastic pillows! It's like we are sleeping at a resort. We have two medium firm and two soft. Both are great! I like a tall, big pillow. My favorite pillow was an old Laura Ashley, so after not being able to find it after a move, I searched for a new one. This fits my king size bed well, and while its a little hard to start, it wears well for me. I'd definitely buy again. These are the best pillows equal to the more unnecessarily expensive pillows. No more neck pain & finally uninterrupted sleep. Finding reasons to come to bed. Highly recommend these pillows. I needed 4 new pillows for my new queen bed that will be used in my hospitality guest room, mostly for international guests when they come into the my region. I was looking for pillows (2 for sleeping and 2 for the shams) that would be easy care (microfiber, polyester filled, hypoallergenic and machine washable). I found all my criteria needed in these pillows with a brand name that brings quality products. Was pleased with my purchase! I was searching for a set of 2 king sized pillows & read through many reviews. I decided to go with this purchase, but somehow I neglected to notice that this was for 1 pillow - not 2. My mistake. But I do like it! I got the medium, and it's perfect for my needs. The price was great for a set of 2, but I think it's a bit pricy for 1. Lesson learned - pay closer attention to the description! I liked the material and the feel of the pillows. The first night we slept on these pillows we were not sure if they were going to work for us, on the second night we slept very good. Every night sine seems to be getting even better, I quess we just had to get use to a good pillow again. We would definitely buy them again. I only use Laura Ashley Pillows. They are hard to find even when I go to Las Vegas! Thank goodness Overstock carries them! I guess I didn’t read enough when I bought these. I like a firm pillow these are not firm. Very comfortable. Held up very well. Pillow is actually very thick and too much for me. However, others might like the extra 'pillow' affect. My head does not sit in the center. The fabric is soft and it its long enough for decorative purposes. No doubt about it, this is well made but it's just a little too firm for me. I know if I break it in more it will flex a little bit more and that would be better. I use it now between my legs to provide spine support. It works great for that. This pillow is very comfortable; supports my head; holds its shape well. The pillow is firm and comfortable. It's holding together well. Love the pillows!!! It’s soft and breathable. "what is the height of these pillows? I'm looking for 7" or higher. thank you." "Do you get a set of two or just one pillow?" This is for ONE single pillow, but when I ordered two of these in mid February the price for the one pillow was only $**. The price has jumped significantly to $**. I would watch the price of the pillow on a daily basis because Overstock has a habit of jacking prices up and down a lot. These Laura Ashley pillows are very nice but you can get them at a much lower price than $** each. It also helps to have a coupon when purchasing. Hope this helps! I would like to try due to the reputation of Laura Ashley products.